Author bio: Michael Webb has appeared on over 500 radio and television shows including Oprah, Men are From Mars/ Women are From Venus, NBC News, 700 Club, The Other Half, Iyanla, To Tell the Truth and FOX News. He has been featured in practically every major newspaper in the United States and is regularly mentioned in the nation's top magazines like Men's Health, Bridal Guide, Cosmopolitan, New Man, Women's Day, Family Circle and dozens others. Blurb: The World's Most Romantic, Unique and Fun Dating Ideas - for singles or married couples. Most dates cost under $20. In this ebook you will discover dozens of dates that are perfect for long distance relationships. There are dates specifically for celebrating the season, birthdays, anniversaries and other special occasions. You will find super inventive picnic date ideas and tips on making dinner dates the most creative and romantic imaginable -- without spending a lot of money or time in preparation. You will also find sections on Vacation Dates, Creative Ways to Ask Someone Out and a couple dozen Dating Coupons -- coupons you can give your sweetheart to redeem for future creative dates. 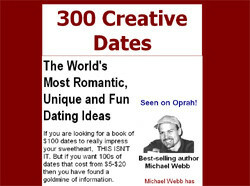 In addition to the 300 Creative Date ideas, this 100-plus page ebook covers the Do's and Don'ts of Dating. If you haven't been on many dates or your dates have not gone very successfully, this information will be invaluable to you.